This is one of my new favorite recipes! 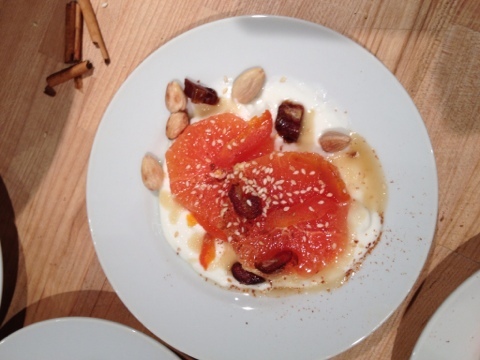 Put some plain Yoghurt on a dish with a couple slices of Orange (Cara Cara have a lovely pink hue), thinly sliced Dried Apricots and Dates (pitted), Toasted Almonds, Sesame Seeds, a drizzle of Honey, Cinnamon, and a splash of Orange Blossom Water (or it’s also good with a few drops of Rose Water). The recipe is from a Moroccan Street Food class I attended last week at Kitchen On Fire. They have classes for all levels and I highly recommend them!